Here’s my truth: sometimes I just overthink dinner, therefore making it stressful, making it a job and taking the joy out of cooking. In reality, dinner doesn’t have to be complicated; it can be as simple as steamed mussels in a gorgeous white wine broth served with a side of crusty bread and a block of cheese. Now tell me that doesn’t sound good…and the best part is it can be ready and served in less than 40 minutes. Plus, it’s cheap! A bag of mussels is usually no more than $3.00-$5.00 a pound. A three-pound bag is plenty for a family of four. This simple and delicious dish can be served any time of the year but is one of my preferred weeknight dinners on a hot summer night. It’s fresh, full of flavor, a perfect pairing with a chilled glass of white wine (Sauvignon Blanc or Gewurztraminer), and yes, my nine year old daughter enjoys it just as much as we do (minus the wine). Trust me, this will become a family favorite on many summer nights. I recommend stopping by the market on your way home, picking up a bag of mussels, and voilà, dinner is served in no time, leaving you more time to enjoy with family. Cheers! To clean the mussels, put them in a large bowl with 2 quarts of water and soak for 20 minutes, or until the mussels disgorge any sand. Drain the mussels, then remove the “beard” from each with your fingers. (The beard is a fibrous tail that you can pull with a pairing knife off of the mussel). If they are dirty, scrub the mussels with a brush under running water. Discard any mussels whose shells aren’t tightly shut or are cracked. Tip: Another way to tell if the mussel is dead is if it is wide open and will not shut when you apply pressure to the shell. In a large non-aluminum stockpot, heat the butter and olive oil over medium heat. Add the shallots and cook for 5 minutes; then add the garlic and cook for 3 more minutes, or until the shallots are translucent. Add the tomatoes, parsley, thyme, wine, salt, and pepper. Add splash of hot sauce or crushed red pepper flakes (preference Frank’s Red Hot). Bring to a boil. Add the mussels, stir well, then cover the pot, and cook over medium heat for about 8 minutes, until all the mussels are opened (discard any that do not open.) With the lid on, shake the pot (like if you were popping some Jiffy pop) once or twice while cooking to be sure the mussels don’t burn on the bottom. 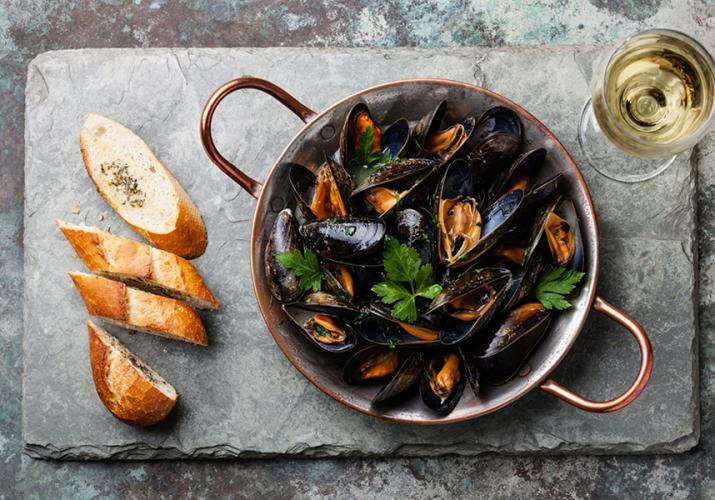 Pour the mussels and the sauce into a large bowl and serve hot with fresh lemon wedges, a side of crusty bread, (i.e. Ciabatta, French Baguette) and a block of cheese. I prefer a nice creamy blue cheese like Saga, or a triple crème cheese like Brie. It melts fast and adds another layer of flavor with this bright full bodied seafood dish.